Description: Anna and her cute little daughter are spending their day in the palace trying on different beauty products for the first time together, do you wanna join them? 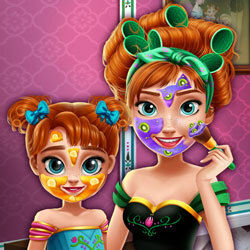 You can apply soothing facial masks, put colorful makeup on the princess and dress the duo in elegant gowns. Create new looks for Anna and her adorable girl to see what a makeover can do!